Posted on January 18, 2016 by Appropos / This entry was posted in Uncategorized and tagged atomizers, Electronic Cigarettes, rba, rda, rebuildable, smoking, vaping. Bookmark the permalink. Rebuildable atomizers are not generally for those just getting into vaping. They are for those who have had some experience with electronic cigarettes and are looking to get more out of their experience. Most people start vaping with something simple and resemblant to an analog cigarette, such as Blu or Juul. Rebuildable atomizer e-cigarettes are so different from an analog cigarette that switching directly to this style can be a little too intense for most. For those looking to take a next step up from the most basic type of e-cigarette, it is recommended to look into clearomizer kits. These kits contain entire set ups with tanks containing pre-built coils surrounded by wells which hold large amounts of e-juice. Many of the biggest names in the industry are centered within this bracket, Aspire and Eleaf’s iStick line being some of the most popular. Rebuildable atomizers provide vapers with a means of achieving more flavor from their juices, the ability to produce larger clouds of vapor, a greater throat hit, as well as more nicotine inhalation. This is achieved via direct e-juice direct contact with an atomizer coil. There are a few different types of rebuildable atomizers. This article will highlight the basic types, providing an overview of each. The most common type of rebuildable atomizer is called an RDA, or ‘dripper’. They are called drippers because you drip juice directly onto the atomizer. Within these atomizers are what are called decks which you build upon. Decks contain posts with positive and negative connections. These posts hold the coils in place and connect them to the battery. Rebuildable atomizers contain at least one positive and one negative post. Many of them contain one central positive post with multiple negative posts surrounding it. This allows for the attachment of multiple coils. 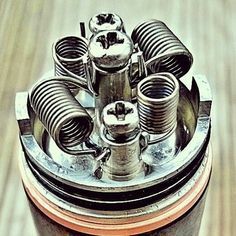 Most rebuildable atomizers have holes drilled into the atomizer that control airflow and allow you to shift between single coil use and multiple coil use. RDA atomizer decks have small wells that contain the juice that is dripped onto them. Generally you can get around ten to twenty drags before having to refill, depending upon the size of the juice well and the types of coils you are using. Atomizers of this type require you to always carry your juice with you because you will need to refill the atomizer often, making it more difficult to use while on the go in comparison to tank atomizers. RBA simply stands for rebuildable atomizer. The term has come to represent a rebuildable tank atomizer or RTA. RTAs are similar to standard tank atomizers, being that they allow you to store a lot more liquid in them than an RDA, but they are like RDAs in the fact that they have a deck that you build on. RTAs look a little intimidating when they are taken apart. There are a lot of pieces, but only really four that you have to concern yourself with: the deck, the chimney, the tank, and the drip tip. The deck is pretty similar to those on RDA style atomizers. One main difference is that these decks have grooves on their sides which allow juice to flow to the coils from the tank. The chimney is a long tube which screws in around the deck and pulls vapor to you. The tank is where the juice is stored. It usually comes in three pieces and is often metal, but can be replaced by plastic if you’re not using juices that get so hot that they crack plastic. The drip tip connects to the chimney, and has a cap around it that provides total separation from the tank. The Genesis was the name of an original design rebuildable atomizer. There have since been a number of tanks modeled around this design which the original Genesis included. The design of the Genesis style atomizers feature a rebuildable deck that is located on top of a liquid tank. A wick, made out of cotton, silica, or steel, goes down into the liquid tank and pulls liquid up onto the deck via capillary action. RDTA stands for rebuildable tank atomizer. These types of atomizers are also referred to as ‘auto drippers’. 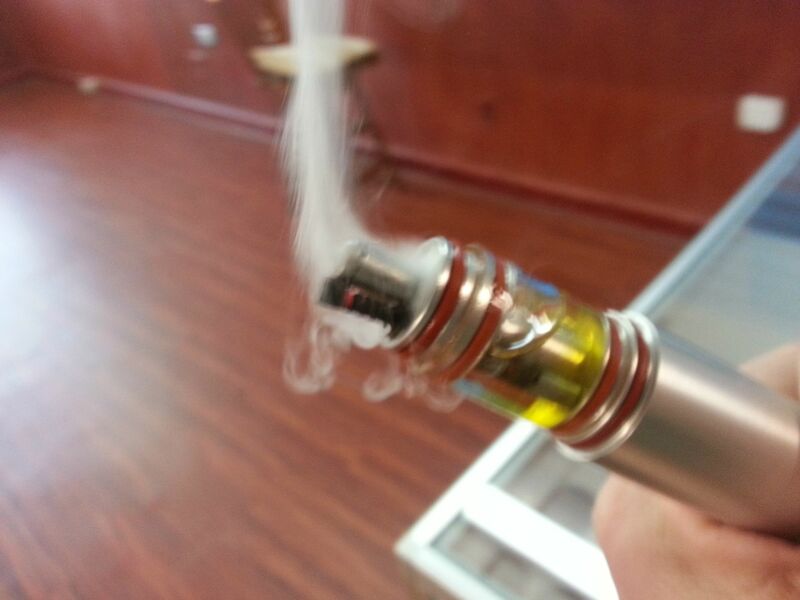 They are designed to drip liquid onto the coils for you. The tanks of these atomizers are generally located above the decks and feature a chimney with a spring wrapped around it. When you push down on the drip tip, juice is pressed through a little hole at the bottom of the tank, dripping the juice onto the coil. There are quite a few different types of rebuildable tanks on the market. Because of their newness and popularity, many more are springing up constantly. They all include a rebuildable deck and often times a tank of some sort. They are for serious vapers looking to get maximum efficiency out of their product and are not recommended for those with little experience. Rebuildable atomizers are the best way to achieve maximum flavor. They transform standard vapers into cloud chasers.